We at Journeys welcome submissions and news items from the College of Education and Human Services alumni. Our magazine is representative of the College from top to bottom and all fields of experience, interest and success, and hope to create a publication that shows the university and the community the strength of our diversity. Submitting written material: All articles, news, events and photographs submitted to the editor must include the author's name, your contact information for verification and contact purposes. Content of articles must be no longer than 950 words. We reserve the right to edit any submissions and make corrections, omit material, or do minor reorganization as required to achieve a reasonably consistent look and feel to the submitted work. If major revisions are required Journeys' editor(s) will rewrite it and give the author an opportunity to review the changes or most likely, ask you to rewrite the article according to some suggested guidelines. The Journeys editor(s) reserve the right to reject any submissions for any reason. Articles not published do not reflect badly on the quality of the submitted material but rather on it being too redundant with existing articles or the submission deadline has been missed or because of space shortage in the layout of the publication. We will not publish anything that we consider libelous or that does not meet our requirements. We do not guarantee when, where, or even if an article will appear in the Journeys Magazine or on its accompanying web site(s). DO NOT compose or send an article in the body of an email. DO NOT send forwarded emails. 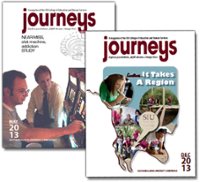 Send all photographs/images to submit2journeys@siu.edu as an email attachment. DO NOT paste images/photographs into a word document. Photographs should be shot at no less than 180 ppi; 300 ppi is recommended and saved as a jpeg. Photographer should supply their name, if credit is desired. Listing individuals from L to R, Front to Back and/or with row numbers.